Welcome to a micro edition of The Quarry. This issue of the journal is a little different to previous issues in that contributors were asked to submit works written specifically for the digital sphere. Produced as part of the postgraduate unit ENGL875 Literature and Writing in Professional Contexts, the issue features contributions from both undergraduate and postgraduate Creative Writing students, as well as Creative Writing graduates. In an evolving publishing industry, today’s writers are being asked to explore ways of producing creative writing that takes advantage of new technology. This approach to writing and publishing enables writers to think differently, to experiment and play, to push beyond the previously accepted limitations of traditional ink and paper storytelling. 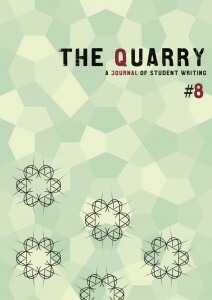 The Quarry #8 seeks to inspire its readers by highlighting the potential of digital writing. PowerPoint poetry exploring the circus of emotions stands proudly beside electronic memories of take-away deep-fried happiness and the hyperlinked Greek god of medicine. From marine fossils to clickable aromatic asthmatics, The Quarry #8 illustrates the variety of interpretations of what being digital means to these writers. Digital writing and publishing is constantly (re)defining itself and developing as writers and publishers continue to take risks and think in unique and unusual ways, and the writing in Issue #8 provides just a sample of what is possible. And, lastly, thank you to Melbourne-based writer, editor, and designer Palila Opit, for designing the cover for this issue, and to Jane Messer for guiding me through the process.